Steven Chamberlain uploaded makefs/20100306-6 which adds a -T flag which will clamp superblock and file timestamps to a given time in epoch format. Emmanuel Bourg uploaded maven-debian-helper/2.0~exp3 which disable the timestamps and set the locale to en_US when generating the javadoc. Reiner Herrmann rebased our experimental version of doxygen on version 1.8.9.1-6. Chris Lamb submitted a patch to make the manpages generated by ruby-ronn reproducible by using the locale-agnostic %Y-%m-%d for the dates. Daniel Kahn Gillmor took another shot at the issue of source path captured in DWARF symbols. A patch has been sent for review by GCC upstream to add the ability to read an environment variable with -fdebug-prefix-map. The following 24 packages have become reproducible due to changes in their build dependencies: gkeyfile-sharp, gprbuild, graphmonkey, gthumb, haskell-yi-language, ion, jackson-databind, jackson-dataformat-smile, jackson-dataformat-xml, jnr-ffi, libcommons-net-java, libproxy, maven-shared-utils, monodevelop-database, mydumper, ndesk-dbus, nini, notify-sharp, pixz, protozero, python-rtslib-fb, slurm-llnl, taglib-sharp, tomboy-latex. git-annex/5.20151208-1 uploaded by Richard Hartmann, fix by Joey Hess. gnudatalanguage/0.9.5-5 uploaded by Axel Beckert, fix by Ole Streicher. kbtin/1.0.16-1 by Adam Borowski, also reported by Chris Lamb. aptitude/0.7.5-1 by Manuel A. Fernandez Montecelo. jacal/1b9-6 uploaded by Barak A. Pearlmutter, original patch by Chris Lamb. ncbi-tools6/6.1.20120620-9 by Aaron M. Ucko; currently FTBFS. vowpal-wabbit/8.1.1-1 uploaded by Yaroslav Halchenko, original patch by Chris Lamb; currently FTBFS. #807159 on monit by Chris Lamb: add support for setting the build date using SOURCE_DATE_EPOCH (already fixed upstream). #807161 on suomi-malaga by Chris Lamb: add support for setting the build date using SOURCE_DATE_EPOCH. #807475 on glance by Chris Lamb: stop recording the number of CPUs on the build system. #807605 on guiqwt by Chris Lamb: add support for setting the copyright year using SOURCE_DATE_EPOCH. 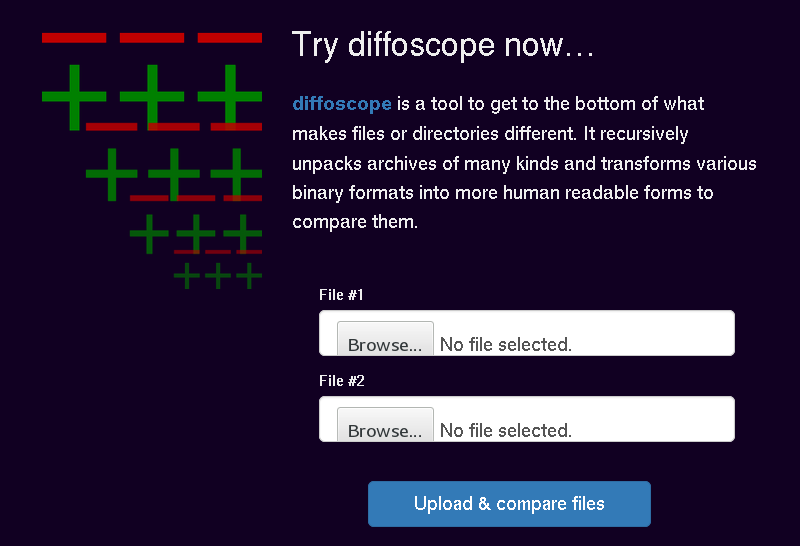 Chris Lamb announced try.diffoscope.org: an online service that runs diffoscope on user provided files. Improvements are welcome. The application is licensed under the AGPLv3. On diffoscope itself, most pending patches have now been merged. Expect a release soon! Most of the code implementing parallel processing has been polished. Sadly, unpacking archive is CPU-bound in most cases, so the current thread-only implementation does not offer much gain on big packages. More work is still require to also add concurrent processes. Ximin Luo has started to write a specification for buildinfo files that could become a larger platform than the limited set of features that were thought so far for Debian .buildinfo. 113 reviews have been removed, 111 added and 56 updated in the previous week. 42 new FTBFS bugs were opened by Chris Lamb and Niko Tyni. New issues identified this week: timestamps_in_documentation_generated_by_docbook_dbtimestamp, timestamps_in_sym_l_files_generated_by_malaga, timestamps_in_edj_files_generated_by_edje_cc. Chris Lamb presented reproducible builds at skroutz.gr.